The park is extremely lucky no one got injured/killed. What I don't get is why the rides computer let another boat leave the lift when the other hadn't cleared the run out. Exactly... I have worked some of these water rides.. .and even I, wouldn't want to be out there standing on those ledges... The Reserviors can be pretty deep. Looks like they need to close the ride down and re-investigate.... possible move some proxies around so that a boat is not allowed to clear the lift until the run out is completely clear. Leviathan - "I am a B&M, I am clearly not the father. I305 is not my child." Millennium Force - "Yes he is Maury... I am 100% sure"
Maury - "Leviathan ..... in the case of possessed juvenile I305 .... you are not the father! Maverick - (giggles with guilty grin)"
Today Shambhala has got the longest queue since opening day (and it's not a bank or national holiday). How long was the wait today? I'm going during summer, so gearing up for some crazy wait times. Twisted Colossus, I305, Skyrush, Iron Rattler, Phoenix, Maverick. rubysparkles wrote: How long was the wait today? I'm going during summer, so gearing up for some crazy wait times. The day of that photo the waiting time was 3 hours. However, I think in summer it will be a little less (maybe 2 hours?) 'cause these days a lot of schools have gone to the park. How insane is the line going to be next Saturday for the Noche Blanca (park open till 4 am)???! I think the Port Aventura Express Platinum will be MANDATORY! Finally we've got the chance to see all the new area at night. Shambhala train has orange LEDs in the front, plus the white ligths from the ridercam. Also the sides of the trains have lights, but they're not working yet. Source: pa-community. ^Very cool, thanks for the pics. I like how the water is dark until the train goes through. Does anyone know if Manta (Orlando) does the same thing? Awesome! I'm leavning tomorrow night for Port Aventura! So excited!!! 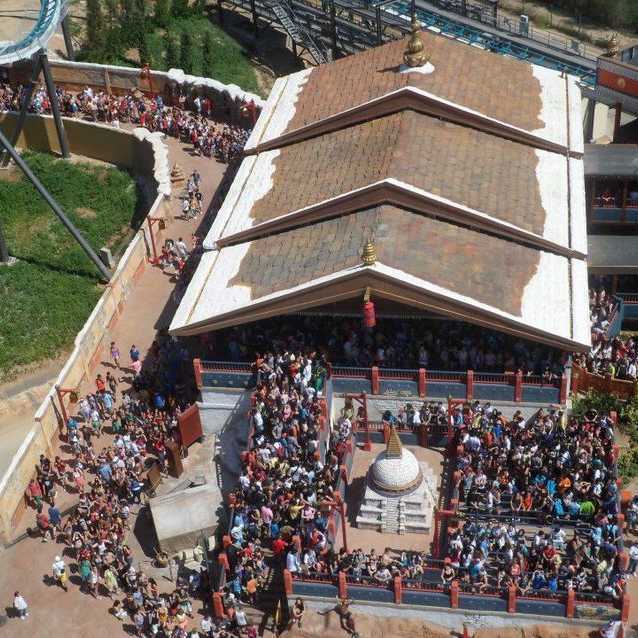 Port Aventura Shambhala - Seat/thigh issue/s? Long-time lurker, first-time poster. Have mooched about these forums a tad bit when Google often redirects me here. I won't lie and pretend I'm the biggest roller coaster fanatic in the world (I do like them, of course, who doesn't, but I wouldn't be the type who'd travel the world for them.. though I'm in Ireland, if I were in the US I'd probably be a fair bit more determined). Anyway, skip to the end, I'm going on a holiday with a group of friends in September, to Salou. Will be a typical lazy holiday, but we all plan to visit Port Aventura, as some of us were there in 2010 and enjoyed it. I was just reading about Shambhala on here (there's a thread about it I know, but I didn't want to bump a month old thread) and it seems that a lot of users have had trouble with it, due to them having 'big thighs'? I Googled further, and came across a rollercoaster themed facebook page where someone was reviewing the ride and said that Port Aventura had said they'd look into changing the seats (apparently it was affecting 2-3 people per ride, but I've no legitimate source for that, so take it with a grain of salt, as they say). One of the guys that'll be coming with is us is a big guy. Now, he's not massive, but he'd be about 15-16 stone if I had to guess, but he does have a lot of weight in his thighs. He was with us last time (2010) and had no problem going on anything at all (he actually commented how comfortable most of the rides were) so I'm just wondering if anyone has any update regarding Shambhala at all, as I've googled a fair bit and have come across nothing at all really. I'd just be a bit worried that we're all gonna be banging on about how Shambala's gonna be great, it's gonna be this, that, etc. and then he sits down and gets told to get off the ride (though judging from the stories I've read, it could be the smallest person in the group that gets kicked off for having awkward thighs). Does anyone know if they've altered or changed the seats, or if the overweigth crowd are still doomed to be laughed off the ride?